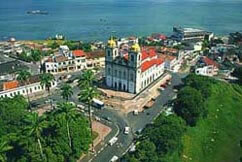 Salvador, Brazil's former colonial capital, lies on beautiful Todos os Santos Bay. This is a striking city and the largest in the northeast, with a population of more than 2,300,000. Its strong African influence derives from the slaves brought to work in the construction of the city, capital of Brazil for over 200 years and for the Portuguese landlords for 4 centuries. With a population dominantly black, their rich cultural heritage is evident in music, dance, cuisine and Candomble religion. The African cultures greatly contrast with the enduring Portuguese flavor of the city's colonial past. Just like in Rio, the people of Salvador know how to celebrate life. They also have their own Carnival at the beginning of each year, not to be missed. Salvador is divided into an upper and lower section. The multicolored homes, red-tiled roofs, a great market, twisting and narrow cobblestone streets, beaches, old squares and nearly 300 churches are all easily visited on foot. In addition to these regular excursions from Salvador, we also offer a series of special Interest Tours in the state of Bahia. * Contact us for more information.